Emerald ash borer (EAB), the most destructive forest pest to enter North America has left hundreds of millions of dead ash trees in its wake. Although this pest has been found throughout our state, many of Indiana’s ash trees are still alive, or dead and still standing. Ash trees killed by emerald ash borer, become extremely brittle and break easily as they decline. Branches can fall on people and property in snowstorms, with a light breeze, or even on a calm clear day. Danger could be hanging over your head in the street, in the forest, and even in your backyard. Why does emerald ash borer make ash trees so brittle? Unlike elms, oaks, and maples, ash trees use a thin ring of conducting tissue to supply water from the roots to the entire tree. Emerald ash borer grubs will damage these functional water pipes as they chew just beneath the bark inside trunks and branches. This causes the tree to dry quickly and the structural wood to become prone to cracking. Internal breaks in the structural wood that bear the weight of the tree are often hidden from view by tree bark. As such, limbs can break and fall at any point along the branch at any time. It is not uncommon to have sizable limbs snap 30 feet off the ground on a calm day. Large ash limbs that have broken off in the upper canopy. The threat of falling limbs is not limited to just dead ash. 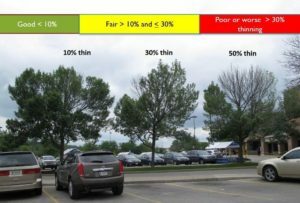 A comparative study of ash trees conducted in Ohio shows that structural integrity of ash trees can begin to decline even when trees are mostly green and have two thirds of the canopy still intact. 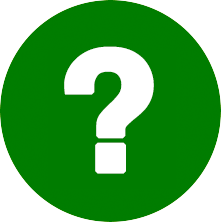 What should I do to protect myself from falling ash trees and limbs? If your tree has lost less than 30% of its canopy hire a professional to protect the tree. If the tree has lost more than 30% of the canopy, make plans to remove it. Delaying removal allows the tree to become more brittle and the problem more dangerous. 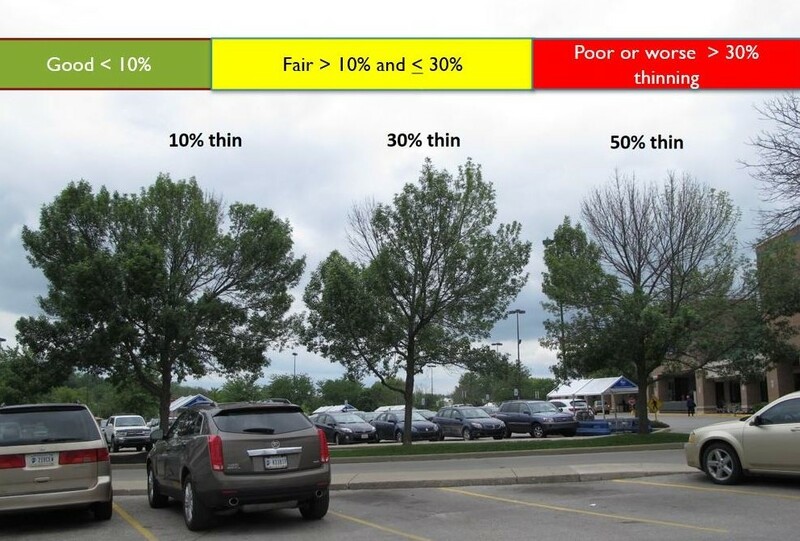 Remember, EAB causes progressively more injury to ash trees as time goes on. The dead parts never come back to life. If you have been treating your tree continue to do so. How should I remove the tree? 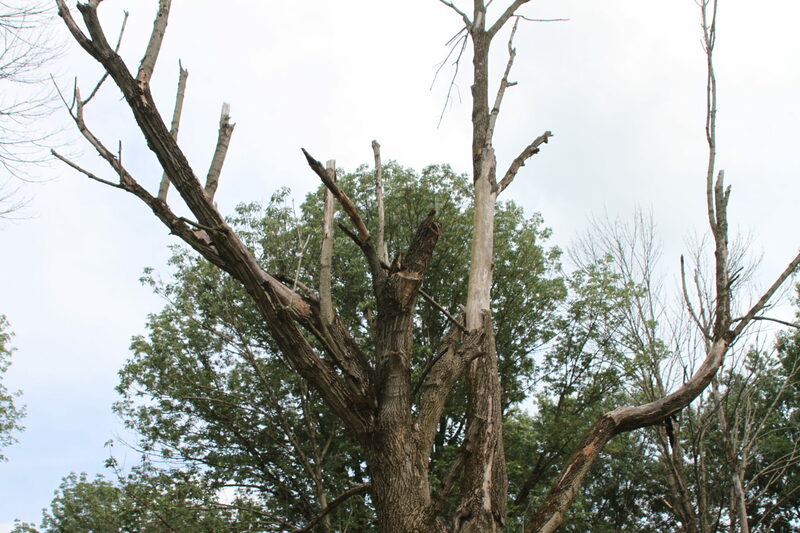 To minimize risk of harm, hire a trained professional who has experience removing emerald ash borer damaged trees. The International Society of Arboriculture maintains a directory of Certified Arborists and their credentials. They can help find an arborist near you. Always get bids from more than one contractor. Be sure your contractor is insured and bonded in case of an accident. Professionals are happy to share this information. Some homeowners might be hesitant to remove dead ash trees because they provide valuable habitat for a range of woodland animals and mushrooms. However, we do not recommend keeping them standing unless you can guarantee that no people, domesticated animals, or property will ever be in their path if they fall. If you have a dead tree that can’t be felled right away or ever, stay away from it until after it has fallen.